Men and women everywhere get spider veins of the face. At least 20 - 25 million Americans are affected by vein disease, making spider veins one of the most common chronic conditions in North America. Spider veins of the face are different from spider veins in the legs. Also known as facial telangiectasias, spider veins of the face are smaller than leg veins. Aside from causing facial redness, they are harmless and generally cause no pain or discomfort. As we age, our skin becomes thinner and it's easier to see these veins. Sun exposure and inflammatory diseases like acne or rosacea cause damage to blood vessel walls and prolonged dilation (from chronic inflammation) leading to broken capillaries. Once broken, the veins will not go back to their normal size or repair themselves. There are some conditions that cause spider veins of the face - and there's no way you can prevent them. These are just some of the diseases that can cause facial telangiectasis. For this reason, it's important to see a doctor. He or she will be able to rule out any serious condition that could be causing your broken facial capillaries. Aging – Facial telangiectasias start at age 38 on average. Gender – Women are more commonly affected than men. Genetics – Heredity is another contributing factor. If your parents had spider veins of the face, you may develop them yourself. Pregnancy – Hormones change during pregnancy and can cause spider veins. Additionally, there is a huge increase in blood volume that puts pressure on the veins. More facial spider veins usually occur with each pregnancy. Alcohol use – Conditions that make the facial blood vessels dilate, like long term alcoholism, can cause broken facial capillaries. Over time, alcoholism increases blood pressure, causing the facial veins to dilate. Repeated dilation locks the veins in that position. Broken capillaries may also indicate liver damage, but usually only after years and years of alcohol abuse. Skin diseases (like rosacea, eczema, and acne) that cause inflammation can cause spider veins. Any skin condition that causes prolonged dilation or irritation can damage veins and delicate capillaries. Hormones – Birth control pills and the hormonal changes during puberty, pregnancy and menopause increase the likelihood of broken capillaries. Will my spider veins and redness get worse? No matter what the cause, spider veins of the face won’t go away on their own. They tend to get worse over time because more abnormal veins develop. Can spider veins of the face be prevented? Some causes of facial telangiectasia are preventable. Since they are just beneath the skin, these veins are delicate and easily damaged. For example, scrubbing your face too vigorously or washing with water that's too hot can break capillaries. Be gentle when you wash your face and use warm water. Apply sunscreen to your face before sun exposure. Read our posts, What is a Physical Sunscreen? AND Sunscreen - Why It's So Important. Treat any sources of skin inflammation like acne and rosacea quickly. Exercise regularly to improve circulation and vein strength. *While these measures won't prevent broken capillaries in every case, they can minimize the chance that you'll develop them. If I already have broken capillaries on my face, what can I do about them? There are a variety of methods to cover, improve or make broken capillaries disappear. The current treatments are minimally invasive with little to no down time. You can be treated in the office and return to work the same day. "There are multiple options to treat spider veins on the face and there is no one best method. The type of treatment depends on the size, number and location of the veins. Treatment options include laser, IPL, Ohmic Thermolysis with VeinWave or VeinGogh, micro needle radio frequency and sclerotherapy. The price of treatment also varies depending on all of the factors mentioned above." 1. Concealers - Use of a good quality concealer may be enough if your broken capillaries are minimal or are in a less obvious place on your face. A green-based color corrector, like this one by Smashbox, (to counteract the redness of the veins) will work better than a skin toned one. 2. Retinol / Vitamin A creams - Retinoids (and retinol creams like AlphaRet) make facial spider veins less visible by building collagen in the dermis and minimizing their appearance. 3. Electrocautery and radiofrequency are inexpensive methods used to vaporize broken capillaries and redness of the face and chest. In both procedures, a fine needle-like tip, set at a low setting, is carefully touched to the capillary, vaporizing the dilated vessels. The procedure may be a little uncomfortable, but it is quick and has a very low chance of scarring. These 2 techniques can easily treat even the tiniest veins that cannot be treated by sclerotherapy or lasers. To learn more about radiofrequency, check out our Spider Veins, Skin Tags, Cherry Angiomas page. "Veinwave, VeinGogh, Veinxpert and Ellman microneedle radio frequency are all variations of a similar technique which involves heating (thermocoagulation, ohmic thermolysis or radio frequency) of very small vessels usually in the 1 to 2 mm range. These are veins that cannot be treated with sclerotherapy." 4. Lasers or IPL (intense pulsed light) are often used to treat spider veins of the face. Lasers use a light beam to seal the vessels off, causing them to dissolve. (Read more about lasers below.) These treatments heat the veins and can result in the destruction of sweat glands. Lasers should be used with caution on people with dark skin because they can destroy the melanin that gives skin its color. This risk increases with the number of treatments given. One to three sessions may be needed to treat facial capillaries and they can be expensive. Laser treatments are painful. They're often described as having a rubber band snapping sensation. There may be a small amount of bruising afterward. 5. Sclerotherapy – this minimally invasive procedure involves injecting salt water or a chemical solution into the vein, which then hardens and disappears. Sclerotherapy is an excellent solution for spider veins of the face that are larger in size. *After treatment, you'll need to use sunscreen daily to keep more broken capillaries from developing. Let's talk about how lasers treat facial spider veins. Dr. Gerald Goldberg, is a dermatologist in Tucson, AZ. He's also a Clinical Professor of Dermatology and Pediatrics at the University of Arizona and an expert on the use of lasers in dermatology. For facial spider veins, he prefers the 532 nm devices, but says the 1064 nm (infrared) devices can be used as well. 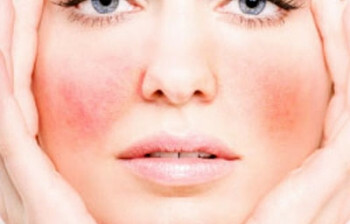 Rosacea and diffuse facial redness responds well to a pulsed dye laser. In his own practice, he uses a laser that combines the 1064 and 532 wavelengths, the Excel V laser. How do lasers treat spider veins? What do those wavelength numbers mean? Lasers create a narrow beam of light. The light is concentrated into a single, very specific frequency and color. That color can be red or green or invisible (like infrared light). And the laser creates waves of light that are the perfectly in step - imagine ocean waves, the crest of each wave exactly aligned with the crests of all the others. Lasers in skincare use something called selective photothermolysis. That is they a target a certain color (called a chromophore) within tissue using a specific light wavelength. The laser sends out that light which creates heat and destroys the selected color target - ideally without damaging surrounding tissue. For things like facial spider veins, the color target (chromophore) is oxyhemoglobin. It's the oxygen-carrying pigment in red blood cells that gives them their red color. The peak absorptions of light energy for oxyhemoglobin are approximately 418, 542, and 577 nm wavelengths. Melanin (which gives your skin its color) absorbs shorter wavelengths: 250 - 1200 nm. So the 532 nm wavelength selectively targets hemoglobin and melanin. While the 1064 nm wavelength targets (in decreasing order) melanin, hemoglobin, and water. The melanin and hemoglobin absorb less light using the 1064. The upside is that the 1064 wavelength is able to penetrate the skin more deeply - so it can reach places the 532 cannot. In plain English please?! The energy from both wavelengths is absorbed by the tiny veins in the skin, but the 532 is especially good at targeting more superficial and smaller vessels. The 1064 wavelength gets absorbed into the deeper layers of skin. By penetrating deeper into the dermis, this wavelength is able to stimulate the underlying blood vessels and skin cells. The end result is a smoother skin texture, tightening, and improvement of small wrinkles. Skin biopsy specimens taken at 1, 2, 3, and 6 month intervals showed new collagen formation. Watch this video of Dr. Jeremy Green, a Dermatologist in Miami, Florida, using the Excel V to treat facial spider veins and rosacea. Do people like the Excel V? It gets a 100% "Worth It" rating on RealSelf based on 9 reviews over all time. How much does treatment with the Excel V cost? According to RealSelf, the average cost for all locations is $475 with a range of anywhere from $100 - $750. The nice thing is - there are lots of options to fix spider veins on your face! Find a good practitioner. Ask lots of questions, and make sure you feel good about the answers. Good luck!